This Sunday, Carolina Panthers and the Denver Broncos will be fighting to take home the Vince Lombardi Trophy at Super Bowl 50. But for cord cutters worried about missing the big game, you have options: this will be the second year that CBS is streaming the event live and for free. This year's show will include all the bells and whistles, with pregame coverage, the halftime show, and commercials. Here's what you need to know about when, where, and how to watch it. What's happening at Super Bowl 50? This year's Super Bowl is on Sunday, February 7th. Kickoff will be at 6:30PM ET, with Jim Nantz, Phil Simms and Tracy Wolfson calling the game. Entertainment-wise, the pregame starts at 11AM ET with a range of programming. NFL Today hosts James Brown, Tony Gonzalez, Bill Cowher, Bart Scott and Boomer Esiason will provide commentary on the upcoming game. There will also be a documentary on NFL stars talking about their careers and a retrospective of the NFL season leading up to the Super Bowl. The highlight of the preshow—whether you're a sports fan or not—is an interview with President Obama and the first lady. While an interview with the President is a typical pregame event, the addition of Michelle Obama to the lineup is new. And as always, the Super Bowl will feature some big music stars. Before kickoff, Lady Gaga will be performing the national anthem and the halftime show will feature Coldplay, Beyonce and Bruno Mars. 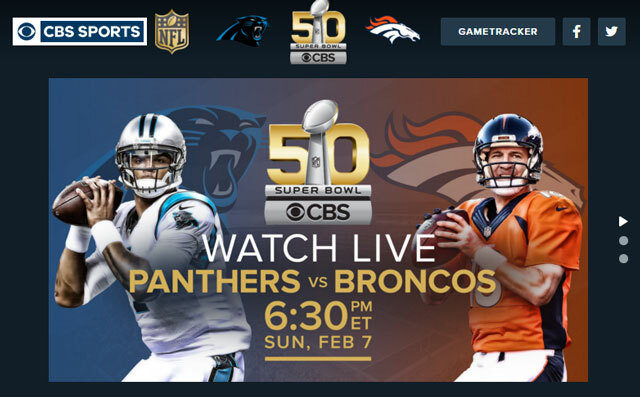 For the first time, CBS will also be streaming the full line-up of commercials live online. While this may not sound like a plus, Super Bowl commercials are often the most entertaining advertisements you'll see all year — and if your team isn't doing well, they may even be the highlight of the show. How can I watch the Super Bowl? The game will be streaming live on CBS's website, where you'll be able to watch it from your computer or tablet — just point your browser to CBS Sports and click play to get started. Or, for Windows 10 users, try the CBS Sports app. A number of streaming devices can get CBS Sports directly on your TV by opening the CBS Sports Channel or App on your device. Look for CBS Sports on your Roku, Apple TV, Android TV, Xbox One or Amazon Fire TV. Or, anyone with a Chromecast can stream the game through the Chrome browser on their computer and "cast," or show, it on their TV. Additionally, Verizon Wireless customers can stream live to their smartphones via the NFL mobile app. And, of course, you can watch it over the air with an HDTV antenna. Our pick for the best indoor HDTV antenna is the Mohu Leaf. You'll need decent bandwidth to make sure your stream looks good—about 5Mbps. If you can stream Netflix in HD, you should be fine. If your Wi-Fi is sluggish, check out our tips for faster Wi-Fi streaming. Or, you may need to invest in a Wi-Fi extender, if you plan on watching the game far away from your router. And, if you're in the market for a new TV, check out our picks for the best TVs under $1,000 and the best TVs under $500.